YOUR CONVICTION: POT THE BALL! If there is one thing I can offer you it is this. Pot the ball! Technique, accuracy and visualisation all mean nothing if you miss and surrender the table to your opponent. The Mind: Clear the mind of complex thoughts and concentrate solely on the task at hand, which in this case is to pot the ball into its designated pocket. Should you miss you immediately concede the table and allow your opponent to dictate, manage, and determine the possible outcome of the rack. You don’t won’t this to happen. So your soul task is to pot the ball. Priority & Duty: Even if you sacrifice prime position for your next shot at least you've not surrendered your position at the table and remained 100% in control of the table and 100% in control of the possible conclusion after rack. 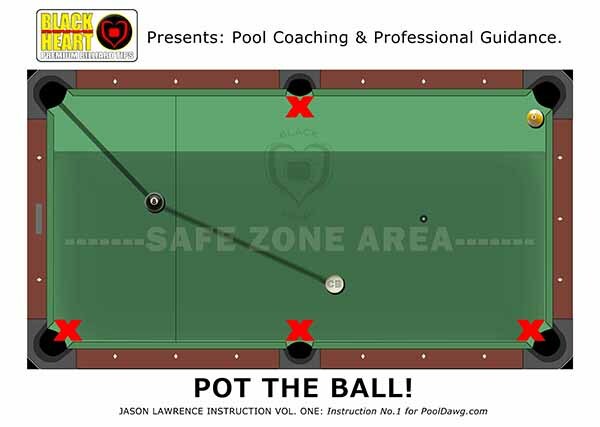 This must be considered your number one priority and duty at all times as an aspiring pool player when at the table and your opponent is in the opposite corner. 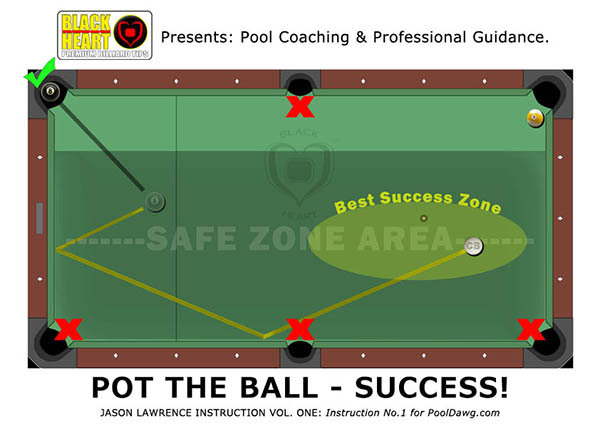 This is a simple three ball layout of the latter stages of a nine ball rack. For league players, this type of scenario is the difference between going to Las Vegas or getting the bus home. DO NOT Do not miss the 8 ball. Do not think about the position of the 9 ball. Do not think about the score or the outcome of the rack. If you are on the hill. Do not focus on the win. DO Think only about making the 8 ball. Be correct with your pre-shot preparation. Chalk your tip well. Ensure that nothing physically can go wrong. Only focus on the table and the task at hand. Pot the ball. Always be positive and good luck! 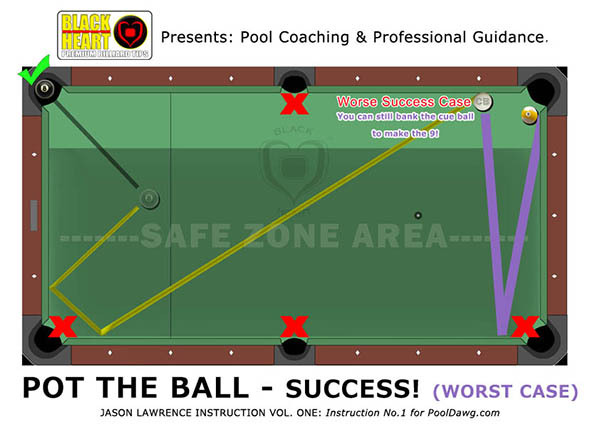 Keep It Simple: This type scenario in a practice session is very simple which many pool players do not bother to set up. To run two balls is not deemed good practice by many. (Remember that ‘The Many’ do not win tournaments or make cash prizes at tournaments.) However, the number of times I have witnessed pool players miss this kind of scenario is unbelievable, simply because he or she is not fully prepared physically or mentally for the task at hand. Know Your Limits: If you think you do not have the ability to successfully make this shot and to then pocket the nine. You really should re-think participating in tournaments and remain at the practice table until it becomes second nature. Understanding who you are is imperative. Is playing pool a fun game, a social occasion with friends or a sport you must win? There is no right or wrong answer, but choosing your path will determine your destiny. Know Your Level: At league novice level, a high number of 9 ball racks are determined by the last 3-4 balls. Therefore the player that can make 3-4 will usually win a high percentage of racks in their matches. On A Personal Note: I get great game satisfaction and pleasure from winning. This is not to say I am a bad sport, however I do play with an instinctive hard competitive nature. I’m always happy when playing pool and the world makes more sense to me when I am potting balls! But that’s me, what about you?